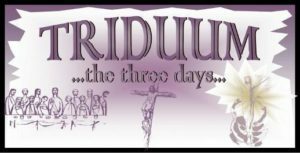 This coming Thursday marks the beginning of the “Holy Triduum.” “Triduum” is Latin and means “three days.” These days are reckoned from sundown to sundown. Day one is Thursday sundown to Friday sundown. Day two is Friday sundown to Saturday sundown. Day three is Saturday sundown to Sunday sundown. Because we tend to think of days beginning at midnight, it can seem confusing as the Holy Triduum begins on Thursday and ends on Sunday (making it feel like four days). The celebration of Easter dates back to New Testament days. This, in fact, is why the church moved their main worship service from the seventh day of the week (Saturday) to the first day of the week (Sunday). Every year, though, they especially celebrated the anniversary of Jesus’ resurrection. As this day was so important it gave rise to one of the first controversies of the Early Church, which was selecting the actual date to celebrate Easter. At least by the second century, Christians celebrated the Great Easter Vigil, an event which began the night of Holy Saturday, continuing until dawn on Easter morning. During this vigil, Christians commemorated salvation history, awaited the return of Jesus, and celebrated the resurrection of Jesus at dawn on Easter Sunday. It was at the vigil that catechumens, after a three year period of catechesis, were baptized and received first communion. The Easter Vigil was the most important day of the liturgical year. Eventually Christians expanded this celebration to a three-day commemoration of Jesus’ passion, death, and resurrection, with the Easter Vigil being the high point of the three day commemoration. Over time, as the liturgical year expanded, the Easter Vigil lost its preeminence, although the three days celebrating the passion, death, and resurrection of Jesus still held an important place in the Church Year. This is why, in my youth, I knew of no Lutheran congregations that had an Easter Vigil service. Our first official English hymnal, the Evangelical Lutheran Hymn-Book, didn’t even list it on our liturgical calendar. Our second English hymnal, The Lutheran Hymnal © 1941, does have the day on its liturgical calendar. From 1962 to 1965 the Roman Catholic Church had its Second Vatican Council. One of its goals was liturgical renewal. While some may debate the beginning date of the modern “Liturgical Renewal Movement,” preferring to date it to this or that book released prior to Vatican 2, there is really no doubt that this council thrust the movement onto the stage. One must always be wise in reviewing Roman Catholic sources as Vatican 2 made it clear that the liturgical renewal efforts of the Roman Catholic Church are intended to convert people to their denomination. In 1956 the Roman Catholic Church removed these three days from the Lent season and made them their own season. However we follow the pre-56 pattern, as do the vast majority of protestant denominations, and consider them as the last part of the Lent season. Our third English hymnal, Lutheran Worship © 1982, sought to restore the Triduum to us, giving us special readings and services for each service. This book was our major effort in joining the larger liturgical renewal conversation happening in Christendom. Our current hymnal, Lutheran Service Book © 2006, continues that conversation. As Lutheranism never abandoned the old liturgical practices, including the Church Calendar, but has sought to purify it, accepting that which is helpful and jettisoning that which is harmful, our participation in this conversation is a natural fit. These three days mark the central events of salvation history. At Our Redeemer we will mark each of these three days with special services that have special liturgies (Maundy Thursday, Good Friday and Easter Sunday). Everyone is encouraged to attend each.